Thanks to your generosity, this past year, we were able to continue replacing the aging and leaky dining room windows at Good Shepherd convent in Grand Prairie, TX. 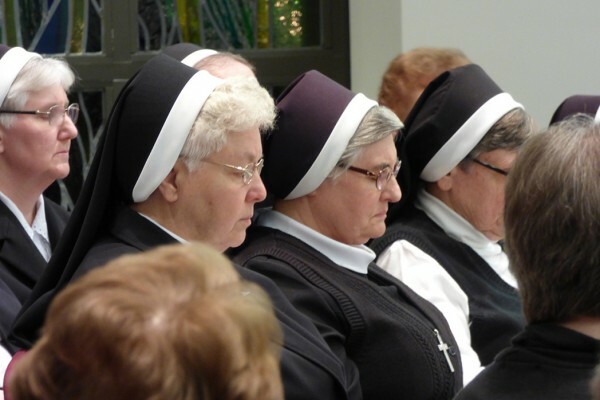 The Sisters have already noticed a difference in comfort level in the convent on hot, and ever hotter days, and they’ve also seen a decrease in their electric bill. The 47 Sisters living at Mount Nazareth in Philadelphia are grateful for your recent donations, which helped us replace an aging boiler and install ceiling fans in the Sisters’ bedrooms. We were also able to retrofit several bathtubs to make them more accessible. All of these wonderful repairs could not have been done without you! But as you know from your own experiences, the list of needs never ends. The average age of the 235 Sisters in our province is 74 years. Many of these Sisters have arthritis and cardiac or pulmonary conditions making the need for safe, sound housing critical to maintaining their health. Just like you, when we’re figuring out our budget, we have to decide what absolutely needs to be repaired or replaced this year, what can wait until next year… or even years later. There’s only so much money available, and it needs to be used to care for our Sisters, support our ministries and fix what unexpectedly breaks! Additional new windows at our convent in Grand Prairie – there are still several that need to be replaced. Recliners to replace the old worn ones in some of the Sisters’ rooms, including a few electric recliners for those elder Sisters who have a difficult time getting up without a little lift. A second boiler for Mount Nazareth in Philadelphia. The current equipment is too old to repair. An emergency generator at Holy Family Convent in Des Plaines that needs to be upgraded so it continues to operate when needed. New garage doors at Jesus, Mary and Joseph Center in Pittsburgh. A new car to replace an unreliable 2000 Mercury Marquis. We do our best to be self-supporting, maintaining ourselves through salaries and small Social Security payments, but there’s usually not enough extra money remaining to care for our Sisters’ homes. And so, on behalf of all our Sisters, we’re humbly asking you for your help. Only you can decide the amount of support you wish to give to the Sisters of the Holy Family of Nazareth, but we assure you that all gifts are greatly appreciated! Please make a secure donation using your credit card or bank account through our website by clicking here. Make a note in the comment/prayer request section that the donation is for our Annual Appeal. You may also download our Mail-In Donation Form here. Our Sisters take comfort in knowing that you love them, and we are confident that you will come through for us again. We really do count on caring friends like you to help keep our Sisters’ homes safe and in good repair. And even if you are unable to make a donation right now, please remember to list your prayer intentions here. Our Sisters will be honored to pray for you and your loved ones. P.S. Our Sisters depend on you to help us make these much needed changes and repairs! So, please make your gift today.